Combines all the most commonly used woodturning gauges into one efficient device. FEATURES AND BENEFITS: The complete 10 in 1 tool; The only gauge available for NOVA Chuck jaw dovetail measurement; Easy to use; Made of heavy duty polycarbonate. FUNCTIONS: Dovetail Gauge - A fast and easy way to create and check a dovetail recess. Perfect companion for your NOVA chuck. Centre Finder - Simple and accurate way for finding the centre on your workpiece. Bowl Chisel Gauge - Handy tool checks different angles for bowl chisels. Diameter Gauge - Effortlessly determine the different diameter size in a workpiece. Ideal for cutting beads. Dowel Gauge - Dowelling can turn dicey when the dowels don't measure up! This gauge helps. Angle Checker - 8 commonly used angles. Checks cutting angles of chisels; knives; blades and scissors. 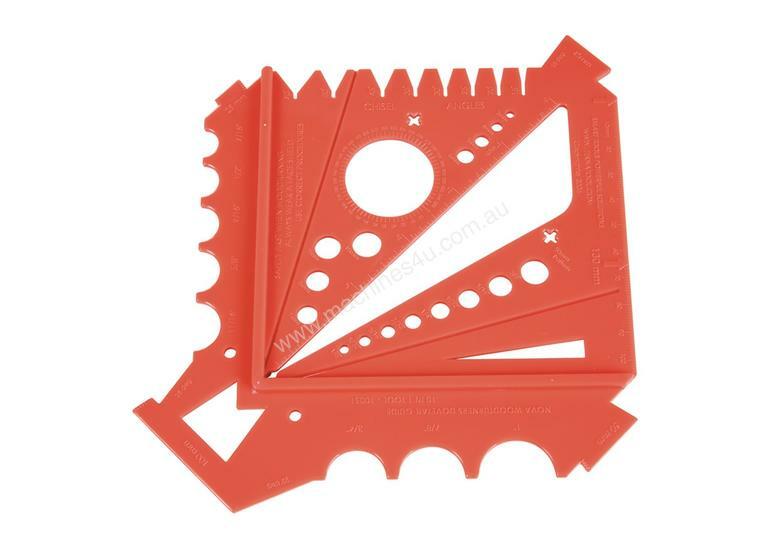 This gauge is also a: Furniture dovetail marking out tool; Ruler scale; Protractor; Faceplate Mark out Tool.